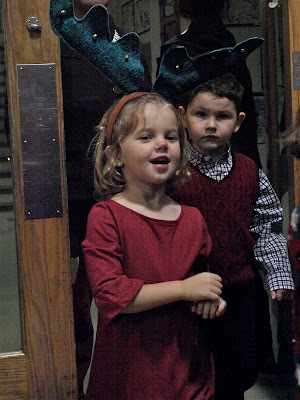 Tonight was FINALLY Zoe's holiday show at school. I say finally because if you stopped by the house anytime in the last few weeks you might have had the chance to hear her practicing since she was constantly singing one or three songs here and there during every day. CONSTANTLY. She was SO excited that it was finally today. She went onto the stage with such confidence. 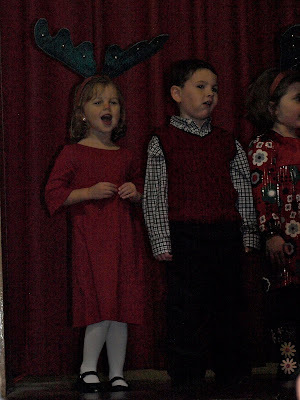 She sang louder and more clearly than all of the other kids right from the get go. Sometimes she tends to be a little shy... but wow... get her on stage and she just shines. Even the teachers have made comments about how much she surprised them. I am one proud mama. 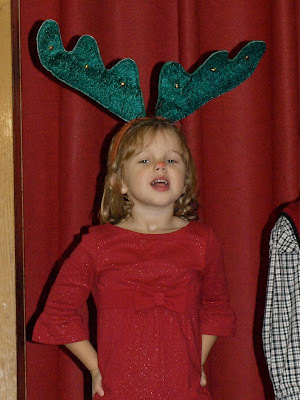 Zoe walked into the room with a smile on her face (and antlers and a red nose... like Rudolph). She seemed to smile her way through singing Rudolph the Red Nosed Reindeer, Jingle Bell Rock, and We Wish You a Merry Christmas. Here is the whole herd of reindeer. I'm sure Santa would be happy to have them pull his sleigh! I just think they all look so festive. If you have 6 minutes and 50 seconds to share... here's the video! Somebody needs to tell me how to get better shots in places like auditoriums and gyms. I realize the lighting is just not ideal... but somebody must have some suggestions to help me improve. I'm thrilled to have these shots for memories... but I just wish the quality was better.